Meatloaf is a big hit in our house, and this recipe is a healthy adaptation of the traditional one made by our mothers. Not that there’s anything wrong with the comforting combination of ground beef and ketchup! 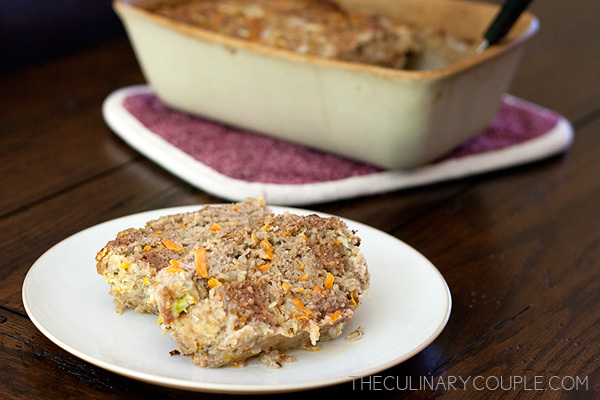 But, in my opinion, this version is more flavorful — with lean ground turkey, sweet Italian sausage, and Italian seasoned breadcrumbs — and more nutritious — with shredded zucchini and carrots. It’s easy for Sam to eat and filling, too. 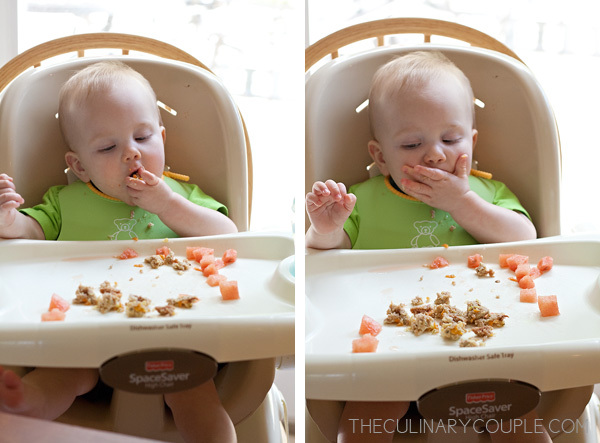 Check out yesterday’s linkup at A Healthy Slice of Life for more Munchkin Meals! Combine all ingredients in a large bowl. Mix well with your hands. Transfer the mixture to the prepared loaf pan, and press down well. Bake for about 1 hour, or until the loaf begins to pull away from the sides of the pan. I’m definitely going to try this out! I’ve made turkey meatloaf for my Sam before, and while the recipe wasn’t the greatest, I froze a bunch of servings and loved being able to have an easy meat option on hand. P loves turkey meatloaf, especially if there is a ton of ketchup involved. Shall give this a try. Have never been too successful with meatloaf before but this recipe looks very interesting.